Because every day is a good day to say it. Four resin sample tests in brass bases conducted last night. 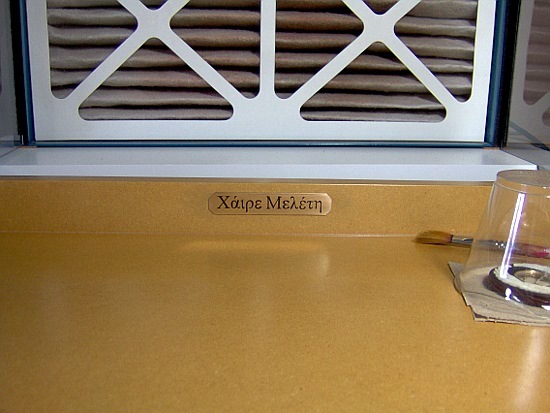 Worked with Durenamel and regular air-cure Colores brand epoxy resins. Durenamel is much harder but requires holding at 130*F for three hours to fully cure to (grindable, polishable) glass-hardness. I’ve worked with the air-cure resin before, but didn’t have the jeweler’s scale and so could not measure proportions of resin and hardener nearly as accurately as I can now. 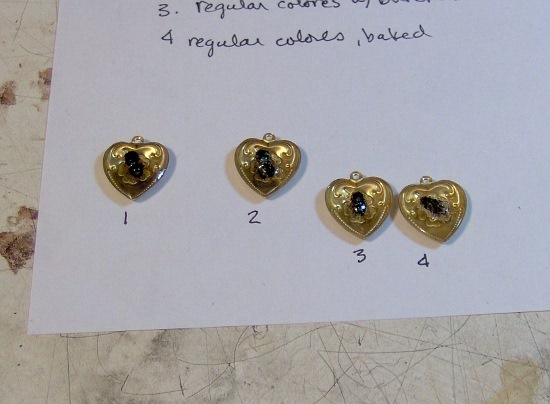 The test pieces were done on identical heart shaped brass stampings. Four dried and cleaned adult (with 99% isopropyl) Lucilia coeruleviridis, L. illustris, or L. caesar (common Calliphorid greenbottle, blowflies) were immersed in the resin in the center of each heart. The larvae of these species will consume rotting animal tissue while leaving healthy tissue intact, and have been used in maggot therapy in the cleaning of difficult infected wounds. Also a forensically important species. Abdomens and thoraxes of adults are also a range of gorgeous iridescent metallic greens and blue-greens. Three of four tests placed into toaster over and held at approximately 130*F for two and a half hours, cooled slowly in oven overnight. Studio ambient temperature around 70*. results 2/14: normal curing, will be non-tacky at 24 hours, fully cured in 72, No additional air bubbles emerged, resin is clear. Green color much darkened, may be brightened and magnified when the full doming is done on second pouring. results 2/14: though all visible bubbles were brushed out from the insect’s nooks and crannies with the heat gun and a needle before putting into the oven, in the morning numerous bubbles appeared in the resin. They probably came from the cavities inside the insect’s body, drawn out by the heat. Unfortunately they did not pop. Resin feels hard to the touch, mostly if not all cured. Color of fly’s body darkened somewhat, metallic sheen not very bright. results 2/14: similar to other baked pieces as above. Resin very hard, nice and clear where there are no bubbles. You are currently browsing the Jackbird Arts blog archives for February, 2012.